That made me research about the event and about MMA – Mixed Martial Arts. I then learnt that this form of fighting sport has its roots back in Greek classical history where fighters employed a combination of grappling and striking skills. In the modern world today, there are many MMA events happening around us – unfortunately, we do not have enough information about them. 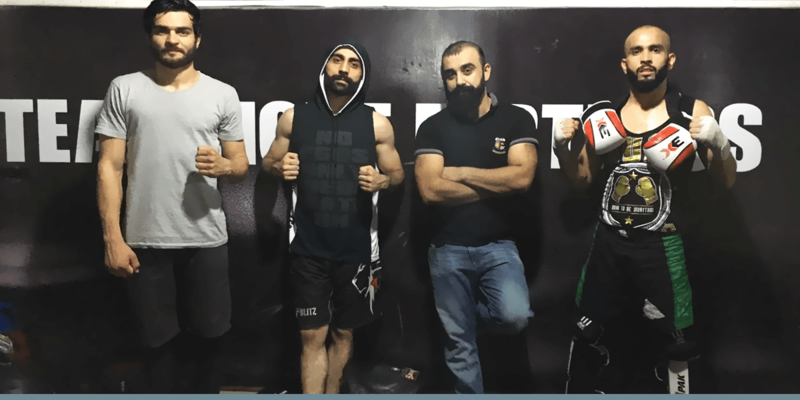 The Singaporean victory threw the spotlight on this sport in Pakistan and of course, it was our unbeaten champion Ahmed Mujtaba aka ‘Ahmed Wolverine Mujtaba’ that sparked the interest! We thought it would be great to know how Ahmed managed to forge ahead in MMA in a country that mostly plays Cricket. Luckily, we connected with him and he graciously agreed for an interview. When it comes to fighters, our common belief is that they must be aggressive, short-tempered, and somewhat rude. Ahmed on the other hand is very kindhearted, very lively and a great person to talk with. He laughs a bit too much for a vicious fighter and it is difficult to imagine that this is the same person who intimidates his opponents when in the ring. So what is Mixed Martial Arts exactly? MMA incorporates various Martial Art disciplines. Some examples are Boxing, Kickboxing, Karate, Taekwondo, Freestyle or Greco-Roman wrestling, Judo, Takedown and Brazilian Jiu-jitsu. You can imagine that unlike any other fighting sports where participants have to master any one discipline, this sport requires mastery in many; and that is definitely not easy. Mujtaba’s personal favourite is Brazilian Jiu-jitsu where he holds a purple belt now. About his championship fight in Singapore? In the past few years, other fighters from Pakistan have tried their luck at winning a championship but unfortunately, they did not succeed. Mujtaba fought out of his skin with the complete self-belief that he will succeed. He attributes his confidence to his belief in Allah. His personal commitment to himself: “I will never give up no matter how painful the situation” – that attitude itself sets him apart from his opponents. After the fight and win, it was only natural for Ahmed to expect a lot more recognition from Pakistani people and media. Unfortunately, Cricket-crazy Pakistan is still far from recognizing other sporting heroes. That made Ahmed a bit disappointed, and he even considered representing another country, though I don’t think he really meant to. He is, and will be, a proud Pakistani who is very keen to raise his country’s flag to new heights. His frustration though, was definitely well placed. MMA, barring the mental and physical demands, which are extreme; is a costly sport and requires a lot of financial support. “In the absence of structured sponsorship, we may continue losing a lot of good talent.” says Ahmed. He is committed to raising more awareness about this sport and hopes that his achievements in the field might help engage the corporate world to come forward and lend its support. The media can also play a greater role in this regard by promoting MMA as a positive change agent in our societies. Despite the slow or non existent response from Pakistanis what keeps you going? 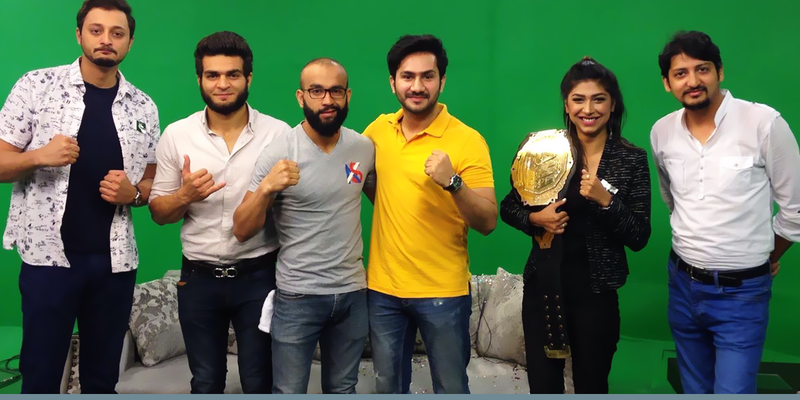 Ahmed’s vision is to promote MMA as a self-defence tool for all youngsters. He strongly believes that sound sporting habits that require physical and mental awareness can help avoid multiple issues in teenagers, including drugs. He specifically campaigns for girls to take up this sport. In his own words; “Nobody would dare tease them ever, once they punch the first one”. Ahmed struck me as a fine young man. He is straight forward, full of life and holds a rare simplicity in his thoughts and personal values that is both praiseworthy and endearing. He is a proud Pakistani who is committed to doing well for himself and his country. Ahmed hails from a well educated family in Quetta. His father is a Doctor. Like any other child in Pakistan, Ahmed’s initial experience in sports was: flirting with Cricket, Basketball and Football. In fact, he was all set to represent Pakistan in Football and Basketball but due to some reason, he did not pursue it. He was all set to become a ramp model as well but Destiny had other plans! So how did you come to reign supreme in MMA? We were surprised by the honest and very unfilmy answer: “I wanted to manage my rage and anger and sought a suitable medium to do that!” He now laughs about it as he himself never thought he would achieve so much international fame and recognition. Once he started, there was literally no looking back. He got into his first fight merely after 10 days and he knocked down his opponent in seconds. The next fight was also a success. This gave confidence to the young man and he began taking the sport seriously. Till then, his family was not aware of his latest interest. So how did your father finally discover your interest and success in MMA? Throw us some filmy dialogues here please? “Tumhain jhoot boltay sharam nahi aati” or, “Aap kabhi mujhay samajh hi nahi saktay dad”. His dad is now his biggest supporter and a very proud father. An amazing story isn’t it ? So how do you manage MMA and your studies? Does MMA always come first? To our surprise and delight, and despite his commitment to MMA, Ahmed is a dedicated student as well, and currently completing his 8th semester in Computer Science at Buitums. The school is clearly very proud of their local star and is making sure that he gets all the support he needs. Of course, he is making his college really proud too; a great example for all young sportsmen and sportswomen indeed. About your family and how they reacted to your rather unconventional sporting interest? My parents are concerned that my younger brother might follow in my footsteps. For them, one international fighter is enough in the family. My cousins are also inspired to follow me; in fact some of them used to tease and bully me when I was young. This is not the story anymore for obvious reasons. Is there a heroine in our hero’s life? Yes, for sure! We’ll have to disappoint all his female fans, Ahmed is engaged to his college friend. Too bad girls, this Wolverine is taken already and apparently, Mrs. to-be-Wolverine is quite capable of keeping a good eye on all his messages and phone calls☺. Ahmed shared something really interesting and against commonly held beliefs, that MMA is a purely male sport. Some of his trainers are actually girls! Yes, girls! And according to him, they train him really well. Contrary to popular belief, these women are holding their own in a predominantly male dominated arena; look at the champ they have helped create! I am sure that a day will come when he will get the deserved recognition. Pakistan will appreciate him and the world will recognise Pakistan through this sport. It is a bit sad that Ahmed has to fight for his due right of recognition and appreciation. I wonder why we always delay doing what is right ? Why do we recognize someone only when he has gone it alone for a long way without any support ? Why is it that the world recognizes him first and then we wake up to his talents ? As a nation, Pakistan needs heroes to set a shining example and inspire our youth. Sporting excellence is one of the best ways to make our nation proud and hopeful. Miandad’s six at Sharjah, Shahbaz Sr.’s incredible dribbling, Mansoor Ahmed’s ‘Saves’ in the ’94 world cup final, and Jahangir and Jan Sher’s finals in Squash tournaments are all moments to be cherished by Pakistanis all over the world. We are lacking those moments now, and we must look beyond Cricket or Hockey to provide us with these laurels. We must recognize and appreciate all our heroes and respect them for what they have done – before it’s too late! You can follow Ahmed on twitter and Facebook at @ahmedwolverine1 and ‘Ahmed Wolverine Mujtaba’ respectively.